NEW 2019 - Meet Jonny Jackpot! 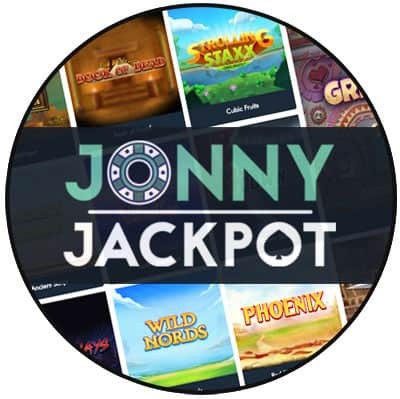 JonnyJackpot Casino is a brand new casino addition to 2019 and it has been growing fast. The Viking felt he had to visit this casino for that very reason. Straight away he started to see why this casino was getting a lot of praise. JonnyJackpot is licenced by both the Malta gambling Authority and the UK Gambling Commission. They also fully support mobile and tablet play which is great for new players that love to play on the go. You will also be happy to read that they conform to the industries Data Protection and Security standards. This means you can gamble here with the peace of might that your personal data is safe and secure. So without any more delays, let us see what the Viking found out about their promotions, games, suppliers, payment providers, and support options. The initial incentive for new players to come and play at JonnyJackpot is the welcome bonus. This offers bonus funds on deposits as well as free spins on a preselected slot. Once you have used these you can claim one of their other promotional offers. There is a host to choose from including win boosts, free spins, and bonus funds on a deposit. One of the perks of returning time and time again to JonnyJackpot is their VIP membership. If you have are eligible to join and do so you can expect to be rewarded with perks like a dedicated VIP host, cashback deals, and faster withdrawals to name just a few of them. One of the best parts is that JonnyJackpot will fast track an eligible member if they were part of another casinos VIP program. JonnyJackpot boasts a vast catalogue of slot games and other for its users to pick from and all of them from top suppliers. So it will come as no surprise to see suppliers like Elk Studios, Fantasma, Fuga Gaming, NYX, Quickspin, and a lot more. With this many different suppliers, you can be sure you will find a great game you will enjoy. This is especially true when you use the ability to search the games section by new games, slots, jackpots, live dealer, scratch, table games, or provider. JonnyJackpot has partnered with some of the best payment providers out there. This means you can use Skrill, Neteller, VISA, MasterCard, GiroPay, BankWire and more at this casino. As for the support options, it could not be easier for players to contact JonnyJackpot. This is because they have a 24/7, seven days a week support team that is there to help you by either live chat or email whichever you prefer. You can also use their FAQ to search for answers. The Viking’s final verdict on JonnyJackpot is that he found the casino to be excellent. He knows players will continue to flock here. This is due to many factors including the casino being available to players in five different languages and playable on mobile and tablet devices. Then there is the fact that the casino is user-friendly and well designed. He also feels that players will love the great choice of games from so many developers. So if you like what you have read then why not follow the Viking and set sail for JonnyJackpot.